After a night of disturbed sleep (Only the French can stand in a hotel next to a sign saying “quiet please, people are sleeping” and chat loudly for half an hour at about 1am. ), I pull myself out of bed at about 6:20am to check whether I’ll get a glorious sunrise view of Kilimanjaro from the hotel roof. Nope, it’s shrouded in cloud, and the weather’s looking rather overcast. A little breakfast, some final packing, and I move all of my gear downstairs for the 8am pick up time, saying goodbye to ever helpful Haj. I wait. After half an hour, I text Methley to ask him what is going on. Another 15 minutes and I try calling his mobile, but it is off. After more waiting I look up the Ahsante office number in the phone book, no answer to that either. What can I do? This is why I don’t like doing organised group treks (cough, ones that I’m not in charge of I mean! ), as by now I could be hitting the trail head! It’s 10am when I give up waiting and decide to walk the half hour over to Ahsante’s office. This is a nuisance as my gear is all packed up and divided up for the trek, so is not great for securing. Plus it’s a good 20 minute walk. Reaching the office, I find there is no Methley, but there are others waiting for him, a group that wants to go to Kilimanjaro via the Rongai route tomorrow. I find the guide I was supposed to have, Pascal, and he knows nothing about trekking with me, Methley hadn’t spoken to him. The Belgian couple who are here saw him enjoying himself a bit too much the evening before at a bar, so I decide a bad hangover might be the only acceptable grounds for forgiving him this shambles. The rain is coming down now, and it gets quite heavy, lessening my disappointment at not setting off today. We taxi back into town as a group, and go to Taj Mahal, a smart small Indian snackery next to my hotel, for some food, before Methley shows up to take us back to the office in his 4x4. Without power though, it turns out there was no need for me to come back, as he can’t process my credit card now anyway. Later it comes back, so a chance to use the internet a bit. Looking at the BBC and Weather Underground, the forecast is bad, with thunderstorms and snow forecast for every day today and the next four. In terms of equipment, I’m using my own, with the exception of rented boots, which obviously I’m quite concerned about – will they be comfortable, will they be waterproof? I also have Methley’s own Leki sticks, which apparently he never uses. And Ahsante provide a decent sleeping bag as part of the price. The diagnosis of my Giardia from the day before! I eat at the Indotaliano Restaurant in the evening with Chris, a Canadian chap who is doing Rongai tomorrow. Indotaliano has become my favourite restaurant in Moshi – good service, and the food, chosen from two separate menus depending on whether you want Indian or Italian food, is really good! My only complaint is that all their local beers (Kilimanjaro, Safari, Tusker etc) are in cans – the bottles contain either Miller or Heineken, yucks! What lies in store today? I sleep really well, and wake up more relaxed, enjoying good solid “motions” for the first time in several days! The weather is marvellous, with a clear view of Kilimanjaro from breakfast. Why the name “Kilimanjaro”? There are lots of theories, but the one that sounds most plausible to me is that in Kiswahili, Kilima means small (!) hill, and -njaro means greatness. It is (by Himalayan standards) a great small hill! What could possibly go wrong?! Hard to believe, but Methley no-showing the pickup *again* could go wrong! Unbelievable! This time, I know the drill, and hop in a taxi to Ahsante, where I find my guide, Alex, who knows about me and is ready to go, once I’ve paid up. The fee is US$ 1,230 for the six day trek. I meet the crew for the trek: Alex (Guide), Octavio (Assistant Guide and Cook), and the three porters: Joachim, Albert and (joining us later) August. 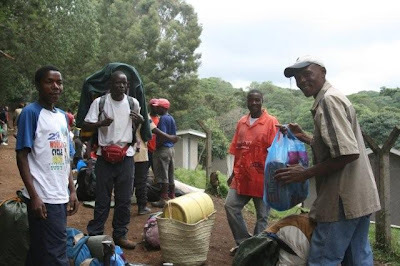 NB: one of the main reasons for choosing Ahsante – they are members of the Kilimanjaro Porters Assistance Project (www.kiliporters.org), and pay their porters the recommended (minimum) wage of 8,000s per day. We move all our gear into a battered old combi bus, in which we are driven to the park. Half way there I remember the sleeping bag and trekking poles, but not to fear, Alex had brought them along. 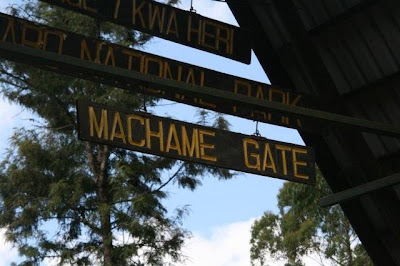 We arrive at Machame Gate, 1738m high, and already my ears are popping a little. I head over with Alex to the office, where I have to sign in, and Alex hands over the electronic payment card for the park fees, which incredibly come to over US$ 600! This is why one shouldn’t squeeze the cost of your trek too much – so much of the price goes straight to greedy park authorities and not to the people doing all the work. It’s clouding over fast as we weigh the bags that the porters will carry – there are restrictions capping the weight to 25kg, which is supposed to be 15kg of gear for the trek, 5kg of their own kit, and, err, I’m not sure where the other 5 comes from, perhaps the weight of the bags themselves. Certainly an easier life than Nepali porters who usually carry about 60kg! Here though, unlike Nepal, they generally carry the gear on their heads! It’s so strange to see a chap with a small daypack on his back, then a large 85L backpack sitting sideways on his head as he calmly walks up the trail. I think I’m regarded as a slightly strange customer in that I’m carrying my own full pack up, with all my gear (well apart from sleeping bag, but it’s so bulky, that’s my excuse – no space!). This is, however, the first time I’ve had porters, and I don’t really like the concept! Certainly if I had been carrying the gear they were carrying, a lot would have been for the chop and our diet would have been substantially limited – Tilman made do with tea and pemmican for most of his expeditions after all! Alex and I set off, leaving the others messing about with the bags. The path is well-maintained with water drains at either side – I guess they must have quite a lot of rainfall here. 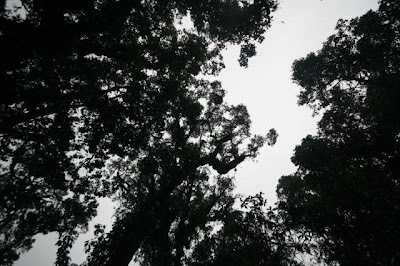 As if to confirm the fact, light rain starts as the trail climbs steadily upwards through thick deciduous forest. Alex puts on his waterproof gear, and the rain promptly stops. He’s apparently the chief guide for Ahsante, so I guess I’m quite lucky. He’s fairly serious though. He tells me about his 7 year old son (who hasn’t climbed Kili yet! 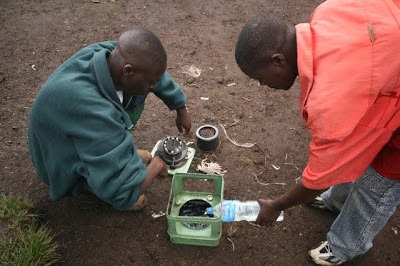 ), and that although he is 33, he still attends college outside of the trekking season – this is one good aspect of African education, it’s much easier to pick up and carry on where you left off, whereas in the UK presumably you’d have to start the year again, plus there’s no stigma over adult education here. We stop for lunch in a clearing somewhere. Next to us are a couple of Norwegian girls, one of whom is quite cute, and reminds me of Lucy! Lunch on the first day is normally a luxurious affair provided by an in-town bakery. Unfortunately, this was never ordered, so we have a rather unappealing sandwich which Octavio made just before we set off, plus a small banana, a tough orange, small Cadburys chocolate bar, a juice box, and a small cake. Plenty of food really! It was handed to me before we started in a heavy metal tin which I returned immediately after transferring the contents to a Ziploc bag. The rest of the crew arrive just as we’ve finished, so we march off together. The locals, both my crew and others, talk so much as they march – Tilman says the only thing that will make an African quiet is the cold, and we haven’t reached that yet. I can hear some thunder in the distance in front of us, it’s strange that I hear the same rumble twice with a slight delay, presumably coming round either side of mountain. The pace is slow, and when I go in front and try to up the speed slightly, Alex tells me to slow down! The reason I want to go faster is that I’m worried about the storms in the area - I will be very annoyed if we get caught in rain because of this meandering pace to which we’re adhering. We hear loud screeching calls which Alex identifies as blue monkeys, there’s a chance we’ll see them on descent. There is also plenty of vocal bird life up in the trees, but not much can be seen through the thick jungle or forest. On the actual trail there are occasional toilets, which are small wooden huts with a pit underneath. Usually no door. We pass a small waterfall, then climb up on to a ridge and follow that up, either side of us the ground drops away steeply into thick wet jungle below. All the trees are lined with moss and lichen, which gives an ethereal quality when combined with the clouds rolling through. No leeches! It is noteworthy that the trails are very clean, and every effort is made to carry all rubbish out. August, our third porter, has apparently gone ahead (I never saw him at the gate) to set up tents for when we arrive, which seems sensible. 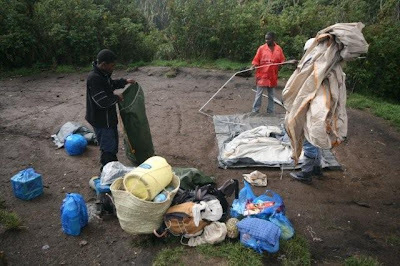 It had been explained to me that every day we would set off leaving the staff to take down tents etc, they’d then zoom past us mid-trek, and by the time we arrive, everything would be set up and ready at the next camp. Sounds almost too good to be true, eh?! (And in fact, it was..!) By now, we were in convoy with porters, all nattering away, some with small radios playing. I’d much prefer to walk alone, roll on Mt Kenya! Alex informs me that there is a possibility of coming straight out of the park on day 5, rather than spending an extra day at a low camp. Sounds good, and would get me out before the weekend so I could sort out my flight tickets. By now, we’re effectively walking through cloud – it’s not raining as such, but everything is getting wet and dripping. We’ll apparently clear the montane forest today. One of the quite interesting aspects of the terrain is that there are quite distinct “layers” up the mountain, with different characteristics and climate, which one would expect to a certain extent, but what surprised me is how delineated these zones are – there’s little overlap – the forest just ends abruptly as if someone had drawn a line around the mountain at 3,000m or so. After a break, we continue with the slow plodding routine with porters – the guy behind me has a radio which breaks the tedium of listening to local chit-chat in Swahili. Instead, along with pop songs, I get to listen to.. Swahili lessons in Swahili on the radio! 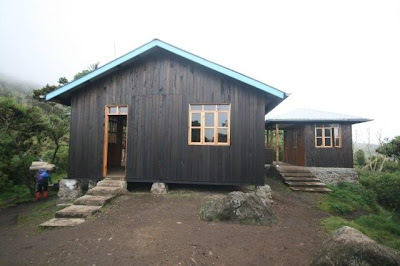 Eventually the forest peters out and we reach a kind of moorland scrub, plus a plateau – pretty Machame camp at 3018m, where we will spend tonight. We sign in at the ranger’s office. 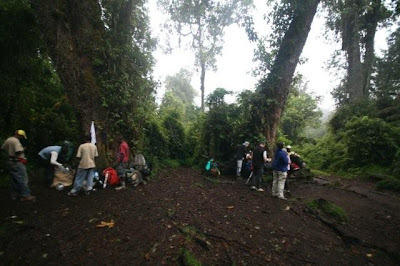 Machame actually means village apparently, and this route we are following up, which is an “ascent only” trail, is called the Machame route. Strange as there aren’t any villages along it. The sun comes out. August hadn’t made tents when we arrived – he was apparently playing cards! And he wasn’t carrying the tents anyway! Oh well.. The chaps quickly put two tents up, one for me, and apparently.. one for the other five of them?! I ask, surely some of them would want to share my tent with me? No, they’re happy in the other tent. So, I have a decent sized three man tent.. pour moi! Next they put the stove together, which I would have thought would be something you’d do before leaving home. Luckily it works, and is placed in the entrance area to their tent. Ah ha, perhaps that’s why they like sharing the tent between the five of them! The camp site is a quite small site. I miss the sociable nature of Nepali lodges, with everyone round the table in the lodge in the evening, having beers. Okay, I miss beers! There are no lodges along the trails here, though a couple of enterprising rangers do offer small cans of beer for 5,000s (just over two pounds!) which of course I’m not prepared to pay! I sit in my nice (newish) tent, boots off, writing notes on my experiences on post-its. Shortly August appears, so I know he exists (! 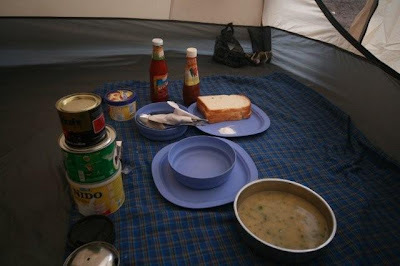 ), bringing my sleeping mat and bag, then a bowl of hot water and soap to wash with. 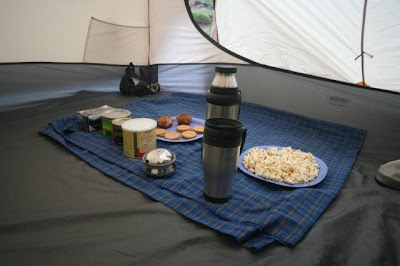 Next, a picnic rug is laid out in the corner of my tent with a thermos flask of hot water, popcorn, tea, coffee, Milo, biscuits, cakes and a large plate of popcorn. In camp, the porters assume the role of waiters, which is nice. With these guys looking after my needs, if only I had a decent book to read! Not being able to find anything in Moshi, I’ve brought Oscar Wilde’s Important of Being Earnest, which of course is a twenty minute read. It gets read many times over the next few days! I check out the toilet situation before dark (Number 1 cause of injury in Nepal apparently, people tripping in the dark trying to go to the loo). It’s a bit of an obstacle course to reach the smelly wooden pit enclosure, round other tents and up slippery muddy trails. I chat with a couple of young American guys as the site fills up. I enjoyed *two* bowls of delicious freshly-made soup with three large slices of bread, then (I was full after the soup, assuming that was all) a whole plate of fried diced potatoes with a lamb stew, served with a separate bowl of vegetable sauce, and an entire avocado. I slowly tried to eat as much as possible, by candle light, and of course ended up returning lots of food. I’d learned my lesson though, with these guys you have to pace yourself until you’re sure there is no more food coming! A necessary visit to the toilet was rather unpleasant, especially so in the dark. I’m just not a natural born squatter! Back to the tent, read for a while, then I get a “customer satisfaction survey” shouted at me from the other tent, which was of course right next to mine! Was I happy with their service so far? If anything displeased me, I was to raise it with Alex, etc. Quite sweet really. Anyway, time for earplugs and sleep. So in theory we’ll reach the summit early on day 5, which is absolute madness! 6,000m climb in 4 ½ days!! 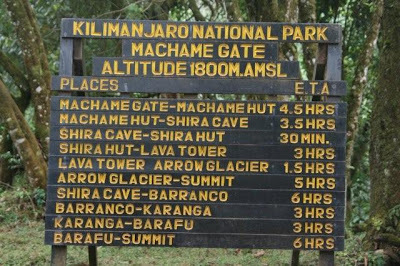 Apparently this route, Machame, is now the busiest route, having taken over from Marangu, perhaps because it has a high rate of success for reaching the summit (gulp! ), due to it being relatively good for acclimatisation, in that on day 3 you reach 4600m before dropping down again. 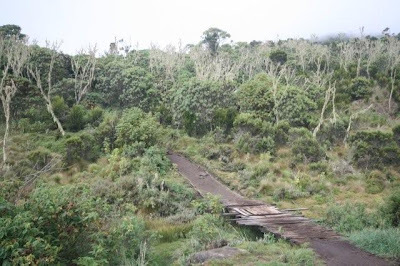 Of the 15,000 people who attempt Kili annually, about 40% succeed apparently, though I don’t know whether success is measured as Uhuru Summit or just reaching Stellar or Gilligan’s Points on the crater rim. It’s not cold as I go to sleep, but during the night the temperature drops sharply, presumably when the clouds roll back. No problem, as I’m in a toasty-warm sleeping bag (so unlike Aconcagua with my Season 2). I poke my head out of the tent and see the clear blue sky and Kibu in sight! To explain Kilimanjaro geography slightly – it consists 3 volcanoes. 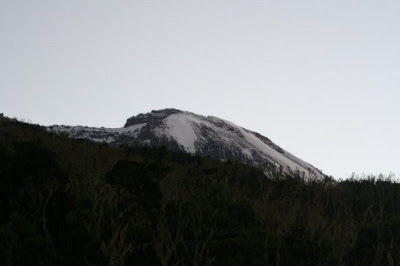 The first to erupt was Shira, which we are heading towards now, then Mawenzi, on the far side, which along with Shira is now inactive, then finally Kibu, the main cone of the mountain, and the only part still active, blew. 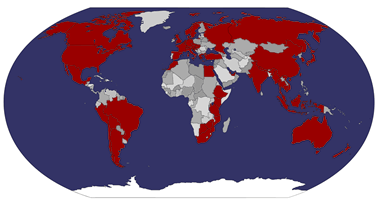 Apparently geologists have found evidence of at least 9 eruptions over time. Dominating the view from Kilimanjaro, and vice-versa, is Mount Meru, Kili’s sister, the other side of Moshi town, sitting above Arusha. Anyway, each volcano has its own summit, but Kibu is the largest, and has the highest summit, Uhuru, which is 5895m (19,340ft) high. Apparently you can still smell sulphur in the 1.5 mile wide crater. The key to Uhuru’s fame or popularity is that it can be climbed without technical mountaineering skills. It’s not even that hard a trek – the issue is the altitude and speed of ascent. I almost worry that I’m at a disadvantage knowing how dangerous this ascent is, having had experience of AMS in Nepal. No headaches yet, at 3018m. Good weather as we start off. “Twande!” – Swahili for “Let’s go!”. Before doing so, the crew have our rubbish weighed, and this is recorded on some sort of permit – they track your rubbish as you go through the park to ensure you’re carrying it all out. Out of camp, there is a good ascent but we take it awfully slowly. As we mount a ridge and carry on up, thick bushlands yield to moorlands. We walk in single file with all the porters. It’s pretty hot in the sun, but clouds (innocent-looking ones) gather below. 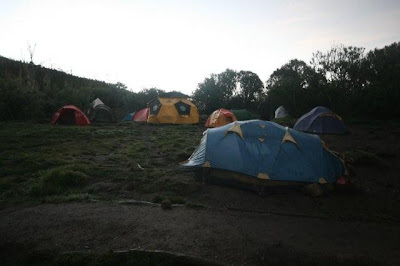 All in all, a fairly nice view down over Machame camp. On the way up, we pass various people – first a New Yorker tells me I’m not planning enough time in Ethiopia (I know! ), then I meet a pretty (a la Mary Wilson) Canadian girl called Andrea who is unfortunately for her walking with a (self-confessed) much slower Aussie girl. There are traffic jams on all the steep bits as the chain slows up. We spot a strange plant, somewhat like an upturned banana tree called a “Snesia”, apparently unique to this area. We stop for lunch on top of a rocky outcrop, and share the spot with crows who are clearly after a meal too. It’s cloudy by now, and the crew whizz past without stopping. Wise decision with hindsight. Alex talks about the other agencies – MEM (Moshi Expeditions), who I spoke to before Ashanti, apparently only pay their porters 20,000s (about 9 pounds) for 6 day trek. At least Ahsante pay the minimum recommended wage of 8,000s per day (about 3UKP70). With less than 1hr left to camp, the rain starts. It’s light but Alex puts on rain gear, and as if in response the rain gets heavier as he does this. I start without him and find a nice overhanging ledge round the corner which I take shelter under. It’s actually a nice spot to relax, with a little waterfall and a pond in front of us. There are a couple of porters there too, and a minute later, Alex comes under. After a few minutes he wants to carry on but I refuse. The clouds look broken, I think it will stop, and it’s very heavy now. The Canadian and Aussie girls trudge past us looking very dejected. Ten minutes later, however, it stops! I’m so glad we waited – I would have been soaked by now, and as anyone knows who’s been high, once stuff is wet, that’s it. You can never dry things at altitude. The rain has stopped, but left a very atmospheric moody sky, with a mix of white and dark clouds rolling across in the mist. Loud thunder claps crash around us as we trek through the beautiful barren scenery. Soon we descend into Shira Camp, on a plain at 3756m. The tents are already set up, and as rain starts again I take shelter with my popcorn and tea. So just over 24hrs into the trek we’re the equivalent of between MBC and ABC on my first Nepali trek - I await the inevitable headache! 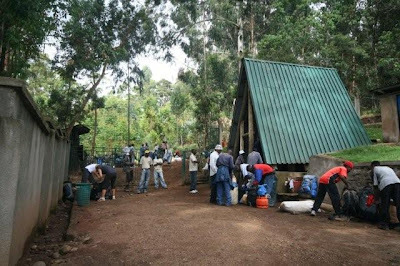 I find out from Alex that it’s not possible to take the extra day I’d been considering on the trek because there is no water at Barafu, the camp where one would want to extend, if anywhere. Like the lunch spot, there are crows about here, so I’m careful to keep the tent closed when I’m outside. It rains for a while then stops, whereupon I step out in my Crocs, marvelling at the Western breach of Kibu poking through the clouds above us, plus the other way looking down I think we can see Moshi. There’s something of a biting wind blowing, and it looks like another thunderstorm will hit us sooner or later. I’ve got that pre-headache buzzy feel in my head. The ranger comes across to my tent with the log book. Occupation today: Lumberjack. Tribe: Pharisee. Didn’t ask for Father’s Name this time. So far, I’d say my kit is appropriate to the trek, though it would be worth my investing in a proper poncho (my 50p one died somewhere along the way). My backpack rain cover is now absolutely hopeless too, so peppered with little tears and holes which seem to admit disproportionate amounts of water to their size. I’ve got a “Summit Kit” together too – a photo of Jina (my mountaineering inspiration), one of her So Green Trekking Agency Badges, one of the tubes of Korean chilli sauce she gave me and Raju Nepali’s business card from Pokhara Palace Hotel. Plan is to take photos up at the summit with all of these items. Chatting with Alex, I find out the relationships between the crew members – Octavio is Alex’s best friend, Joachim is his cousin, and the other two porters are all neighbours from his home village. So that’s why they seem to get on quite well! Mr Sunshine puts in an appearance, and we have a great view of the mountain! I bump into Andrea and we chat a bit, she’s five weeks into a three month charity placement thing in Tanzania. I’m quite impressed she’s managed to get away this early into the placement. The sun warms things up considerably, so I eat dinner out on a rock next to my tent. The meal is of the usual brutal quantities, but this time I’m ready for it. First, we have freshly-made pancakes, a plate of about six, with honey, though I use chilli sauce and ketchup instead, probably having salt cravings after perspiring on the trek. Alex, walking past, asks “Where is soup for your pancakes?”. Eh? Soup for my pancakes? Anyway, moments later, out comes a large bowl of thick vegetable soup. Luckily I stopped after two pancakes, as of course I suspect the ambush coming. 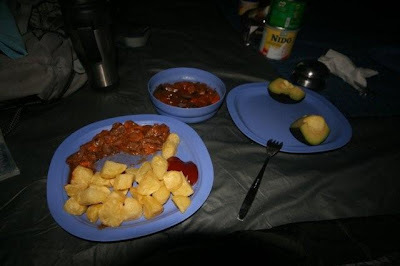 Moving inside my tent as it darks, out comes a whole large plate full of rice, with a good pile of cabbage round the edge, a separate bowl of tuna curry sauce, and then a plate full of mango! Delicious, but… goodness me, what are they trying to do?! I compliment the lot with plenty of chilli sauce, and just as well, as with no clouds and plenty of wind, it’s a chilly night. 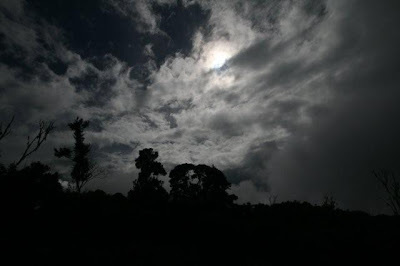 There’s a full moon now too, which will be handy for the night ascent – it’s like having a floodlight shining over camp. Bedtime at 7:30pm!